If you're having a hard time dropping unwanted pounds, you may be tempted to consider other options, such as diet pills. While some of these over-the-counter pills contain the "best" ingredients at promoting weight loss, they don't produce dramatic results. If you do end up taking additional supplements to aid your weight-loss efforts (such as the ones listed below), talk with your doctor first to discuss safety and effectiveness of these types of diet pills and also to learn about prescription weight loss pill options. 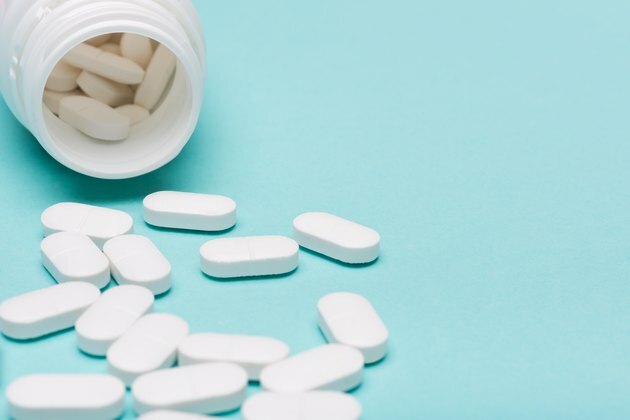 The "best diet pills" you see advertised on late-night infomercials and that you can pluck off the local drugstore shelves aren't medicines regulated by the Food and Drug Administration (FDA). Rather, they're classified as supplements so they don't have to prove they work. The best way to lose weight is with committed diet and exercise. Diet pills can help some people as a complement to these strategies, but they aren't a magic bullet when it comes to reducing pounds. That said, there are a few options of supplements that can aid in your weight-loss efforts. Many diet pills contain caffeine as a single ingredient or in the form of an herb such as guarana, yerba mate or kola nut. As a stimulant, caffeine increases metabolism, but generally not enough to create a significant weight loss, according to the Office of Dietary Supplements. The caffeine-containing herbs may help with weight loss by delaying gastric emptying — meaning they keep your stomach full longer — according to a 2001 study published in the Journal of Human Nutrition and Dietetics. But a more recent 2017 review of the research published in the International Journal of Food Sciences and Nutrition determined that caffeine has an uncertain affect on hunger and appetite perceptions. Read more: How Do Caffeine Pills Affect the Body? Green tea is also a source of caffeine, but that's not the only active ingredient believed to help with weight loss. The tea also contains catechins, which are phytochemicals that may increase metabolism. However, while green tea is a source of nutrients that help you burn calories, it doesn't help you lose that much weight on its own, according to a 2014 review published in Canadian Pharmacists Journal. The researchers of this review study, which included a total of more than 20 studies and thousands of participants, concluded that weight loss from green tea was so small it wasn't clinically important. Green coffee beans, which are unroasted beans, are also a source of caffeine and contain high amounts of chlorogenic acid. This particular acid has been shown to help prevent the accumulation of fat in both mice and humans, according to the Office of Dietary Supplements. 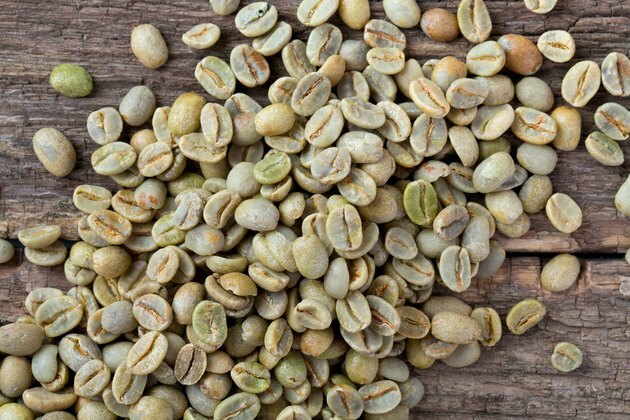 While it appears that green coffee bean extract is promising for weight loss, very few human studies without biased data exist, according to a 2011 review study published in Gastroenterology Research and Practice. To better assess how green coffee bean extract might help with weight loss, additional clinical research is necessary. Although some additional studies have been performed in the past few years, these studies were performed by manufacturers of the supplement and were small in scope. No large-scale studies on humans have yet been performed. White kidney beans are legumes native to Central and South America that prevent the breakdown and absorption of carbs and suppress appetite. In diet pills, the legume appears as Phaseolus vulgaris. When taken as part of a reduced-calorie diet, participants in a small study — published in 2014 in Obesity — lost 6 pounds over a 12-week period, compared to two pounds in the control group. Although a review study from 2011 published in the British Journal of Nutrition says much of the research on white kidney beans and weight loss are flawed, and recommends larger, more rigorous studies to figure out how well it works, a 2018 metanalysis evaluating a particular brand of the product concluded otherwise. The paper, published in Foods, reviewed 11 studies regarding the supplement and weight loss and three studies on Phaseolus vulgaris L and fat loss. The researchers found that the Phase 2 brand of Phaseolus vulgaris L. had statistically significant effects on body weight and body fat. That said, the supplement is still no substitute for traditional weight-loss efforts. Conjugated linoleic acid, or CLA, is made from linoleic acid and occurs naturally in animal foods such as milk and beef. Scientists theorize that CLA helps promote weight loss by destroying fat cells. Supplementation with CLA appears to help promote weight loss in obese people, according to a 2012 study published in Nutrition. Additionally, a review study on CLA and weight loss reports mixed results, and study authors expressed concern that it might increase triglyceride and LDL, or bad, cholesterol, while lowering HDL, or good, cholesterol. If you're worried about your cholesterol levels, that's a significant drawback. Pyruvate is a chemical produced by your body during the production of glucose. It's also found in some diet pills, usually in the form of calcium pyruvate. Pyruvate might increase your fat-burning potential and metabolism, which could theoretically help you lose weight. While pyruvate does appear to help promote small amounts of weight loss, the current research is limited, according to a 2014 review study from Critical Reviews in Food Science and Nutrition. And like many of the ingredients found in diet pills, more research is needed to further evaluate weight-loss claims. Chromium is an essential trace mineral that helps control your blood sugar levels, and fuels an active lifestyle by helping your cells access glucose, a fast and easy source of energy. It might help you increase your lean body mass and burn more. Chromium supplementation is linked to weight loss, according to a 2013 review study published in Obesity Review, which looked at the results from 11 prior studies. However, like other diet pills, chromium alone didn't trigger significant weight loss; it seems to offer a modest benefit at best. Many over-the-counter diet pills are unproven in their claims, but some are downright dangerous. Consumer Reports published a report in 2017 warning against the consumption of certain supplements as they can have serious implications when it comes to your health. Among those supplements warned against included caffeine powder and green tea powder, which are hard to get correct doses of and, in excess, can elevate your heart rate, increase blood pressure and even lead to death if taken in excess or combined with too many other stimulants. Green tea powder also has the possible side effects of causing ringing in the ears, reduced iron absorption, dizziness and exacerbation of glaucoma. Other weight loss pill ingredients to watch out for include germander and usnic acid, and chaparral, which can damage the liver. Methylsynephrine is another stimulant used in weight-loss pills that can cause cardiac arrest and heart rhythm abnormalities. While taking a diet pill might seem like the easiest route to weight loss, their relative ineffectiveness and possibility of side effects make them a poor strategy. And, even if despite the possible drawbacks you still want to take a diet pill to help you lose weight, know that these supplements can really only serve as an adjunct to the tried-and-true weight-loss methods of diet, exercise and stress reduction. A healthy, portion-controlled diet supports weight loss and maintenance of a new, healthy shape. Make the vast majority of your meals include lean proteins — such as white-meat poultry, flank steak, and tuna — fresh produce and whole grains. Include small amounts of healthy fats, such as extra virgin olive oil and avocado. Precision Nutrition offers an easy-to-follow portion control guide that recommends you stick to one or two palm-sized portions of protein, a cupped handful of whole grains or other healthy carbohydrates and a fistful — or two — of fresh veggies at each meal. Men usually do best with larger portion sizes. Make your fat serving measure about the size of your thumb. Research published in the European Journal of Nutrition in 2017 showed that when people adhered to a healthy eating pattern and prepped foods at home, they were more likely to maintain weight loss. Other habits in the study that supported maintenance of a healthy weight were eating at a slower pace and eating smaller portions more frequently. Increasing your physical activity levels is critical to weight-loss success and to keeping that weight off. Combine it with a healthy diet and you'll see an improvement in your weight and overall health. Exercise doesn't have to happen in a gym or make you feel overwhelmed. Find an activity you enjoy and do it five or six days per week — trying for the minimum of 30 minutes per day on most days. If you can do more, you'll contribute even more to weight loss. Stress contributes to weight gain and can stand in the way of your weight-loss efforts. When you're stressed, you tend to make less-than-optimal food and beverage choices. You may feel you have no time or motivation to exercise. Plus, stress wreaks havoc on your hormones and sleep patterns, which further get in the way of weight loss. Reduce stress by adopting self-care rituals, including yoga, mediation and massage. Simply allowing time for yourself — delegating more and saying "no" to nonessential duties at work or at home can also help. UC Davis Medical Center: Do Diet Pills Really Work? OBesity Review: Does stress influence sleep patterns, food intake, weight gain, abdominal obesity and weight loss interventions and vice versa?